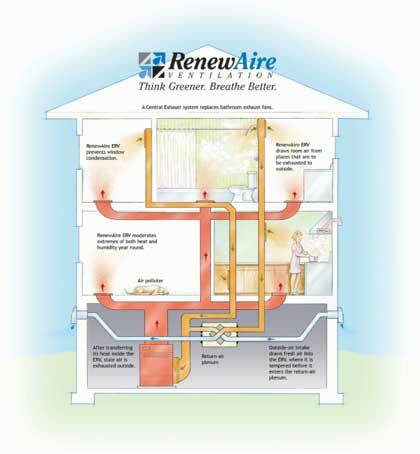 Today's homes are built air tight to reduce energy loss. Howver, because of this, air pollutants in the home become trapped indoors. Effective ventilation in the home can remove indoor air pollutants such as Carbon Dioxide (CO2), formaldehyde, ammonia and volatile organic compounds (VOCs) that are harmful to human's health. Zuba-Central provides whole-home heating and cooling comfort, and with the integration of a RenewAire Energy Recovery Ventilator, this complete system is the solution for optimizing indoor air quality for your home. RenewAire ERV is energy efficient and can be seamlessly integrated with Zuba-Central to provide effective ventilation and fresh air in your home. These ERV units are easy to install, operate and maintain. Visit RenewAire ERV for more information.